The CD22 antigen (BL-CAM) is a transmembrane glycoprotein of the immunoglobulin superfamily. It may be expressed as two different isoforms: the α form (130 kDa) and the β form (140 kDa). CD22 antigen is a B cell restricted antigen expressed in the cytoplasm of B cell progenitors and on the surface of mature B lymphocytes. 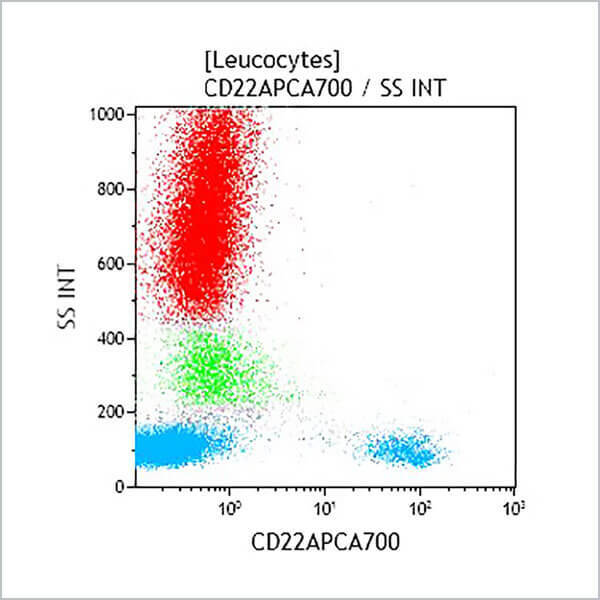 CD22 expression is lost after B-cell activation, prior to the plasma cell stage. It is absent from peripheral blood T lymphocytes, granulocytes, monocytes. *Alexa Fluor and Pacific Blue are registered trademarks of Molecular Probes, Inc.